Catacombs - The Chip's Challenge Wiki - The Chip's Challenge Database that anyone can edit! 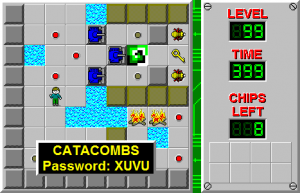 Catacombs is the 99th level in Chip's Challenge 1. 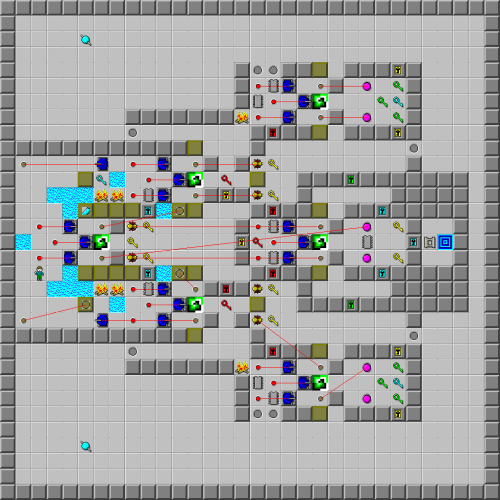 With the exceptions of different lock colors, a hidden pair of flippers at (5, 13) which allow Chip to escape in Lynx (as blue keys are erased by blocks), and a blue key and free block on the top to allow Chip to move to the next room, Catacombs is completely symmetrical. The progression through Catacombs is two rooms northeast, then into the center, two rooms down, and then collect the blue key on the right side, which will eventually be used to exit. From there, play through the green lock above that and then the one near the exit, then blast east into the exit. However, bold isn't all that easy, as luck plays a significant role. There are two instances where Chip must push a block across a random force floor and have it go either U, or try to go L and then L or U as he pushes it (a 3/8 chance in total), and then follow up and have himself go right (a 1/4 chance). There is also a third instance where only Chip has to go across and hope that he goes right (a 1/4 chance). This works out to 3/32 * 3/32 * 1/4 = a 9/4096, or 1/455.11 chance of success. Fortunately, the level is pretty short. This page was last edited on 9 March 2019, at 17:41.